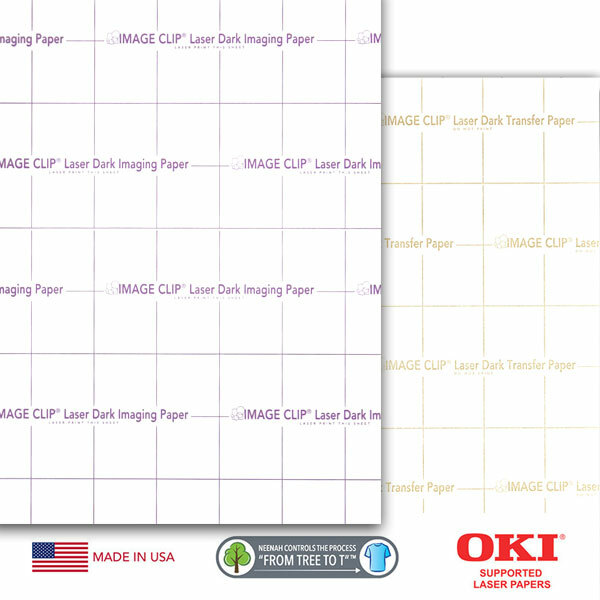 IMAGE CLIP® Laser Dark is compatible with oil or oil-less laser color copiers or color laser printers and works well on cotton and 50-50 blend fabrics. There is no need to trim the paper. IMAGE CLIP® Laser Dark Heat Transfer Paper is self-weeding and leaves no background plastic polymer. Recommended for applying Clip Art, Line Art or Vector Art graphics. Not recommended for Bitmap or Photographic output. Choose fabrics that have a tight weave. WARNING: Do not feed the transfer sheet (gold grid) through your color laser copier or color laser printer!